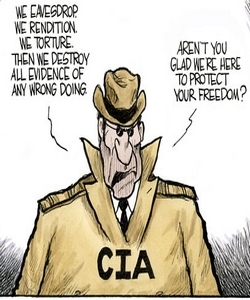 One consequence of the early “war on terror” years was that the lines between CIA and military activities got blurred. The Pentagon moved into clandestine areas that had traditionally been the province of the CIA. Special Forces began operating secretly abroad in ways that worried the CIA, the State Department and foreign governments. The Obama administration is finishing an effort to redraw those lines more carefully, issuing a series of new executive orders (known as “EXORDS”) to guide the military’s intelligence activities, sometimes through what are known as “special access programs,” or SAPs. The power of combining CIA and military resources was shown in the May 2 raid that killed Osama bin Laden. The firepower came from the Navy SEALs, a Special Forces unit that normally functions under the Title 10 war-fighting authority of the military. Because the SEALs were operating inside Pakistan, a country with which the United States isn’t at war, the CIA supervised the mission under Title 50, which allows the agency to conduct “deniable” activities overseas. The system worked in the Abbottabad raid. But over the past 10 years, there have been instances when crossing the traditional lines created potential problems for the United States. It’s especially important to understand these boundaries now as Gen. David Petraeus prepares to take over as CIA director. If the rules aren’t clear, people at home and abroad may worry about a possible “militarization” of U.S. intelligence. This column will examine how the lines got blurred between 2001 and 2006, when Donald Rumsfeld was secretary of defense and the war on terror presented new and difficult legal issues. President George W. Bush initially embraced Rumsfeld’s decisions, but at the end of 2006, he changed course. A second column will examine the cleanup that was started in 2007 by Bob Gates, Rumsfeld’s successor. It’s one of Gates’s most important but little-understood legacies. Rumsfeld has argued that his actions were proper and necessary, whatever second-guessers may say. al-Qaeda that arguably created a global battlespace against terrorists. Rumsfeld was worried that the Pentagon wasn’t effectively using its best assets, the highly trained Special Forces. That concern was compounded by the success of the CIA’s small paramilitary force in the 2001 Afghanistan war. Rumsfeld was creative in expanding his turf to fight a global war on terrorism. He installed Stephen Cambone in the new post of undersecretary of intelligence in 2003. He also authorized forward-deployed Special Forces units overseas. These became known as “Military Liaison Elements,” or MLEs, since part of their mission was to work with local special forces. But the MLEs also conducted what was known as “operational preparation of the environment” in countries that weren’t war zones. CIA and State Department officials worried that the Pentagon was creating alternative intelligence platforms. “We went nuts,” recalls McLaughlin. Rumsfeld cooperated in working out rules for coordination with local station chiefs and ambassadors, but the foray left scars. Former intelligence officials recall sensitive “preparation of the environment” missions inside nations such as Iran. I recently reviewed an August 2006 “SAP Action Memo” from Cambone to Rumsfeld requesting an extension of a “commercial covert operative” in two volatile Arab countries. The military isn’t authorized to conduct “covert” activities, so a senior Defense official says this may simply be “sloppy writing.” It could also be something inappropriate. Another point of friction was Iraqi exile leader Ahmed Chalabi. The CIA refused to deal with him, arguing that he was unreliable. Here, too, Rumsfeld approved a workaround. Chalabi had his own special liaison officer in 2003 and 2004 who connected him with Centcom and top Pentagon officials.